SCENTURION® was developed to provide a safe and effective way to kill bacteria and neutralize the other causes of odor in athletic clothing, shoes and personal gear. By doing so, the cycle of body exposure to these microbes is broken. Once items are treated with SCENTURION®, its clear and flexible antimicrobial micro-coating provides an 'ionic shield', effectively keeping athletic clothing, shoes, and personal gear microbe-free. SCENTURION® is formulated to treat shoes, sneakers, cleats, skates, boots, pads, gloves, hats & helmets, shin guards, clothing, sleeping bags, tents, pet bedding & crates, home furnishings, carpeting, mattresses, auto carpet & seats. SCENTURION® is Activated by Perspiration! The non-toxic eliminator of odor and germs… deodorize and sanitize in a single spray! People activate the antimicrobial power of SCENTURION® by wearing their treated clothing, shoes, and gear! 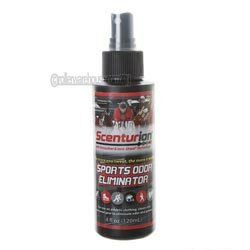 Perspiration activates the antimicrobial shield of SCENTURION® releasing silver ions which eradicate sources of odor, including bacteria, fungus, mold, ammonia, urea, smelly fatty acids, and steroids (produced via skin and sweat glands).